to act as body warmers. Heat It! Freeze It! Relax! Looking for pain relief without medication? Need stress reduction without pills? The aromatherapy in our Herbal Hot/Cold Pacs was developed in 1996 by Dr. Chris Meletis, a naturopathic physician with an extensive background in herbal formulations and their synergistic relationships. Dr. Meletis is the director and dean of clinical education at the National College of Naturopathic Medicine of Portland, Oregon. Our blend of 12 organic herbs (lavender, hops, cinnamon, peppermint, spearmint, rosemary, valerian root, lemongrass, chamomile, yellow dock, yarrow and white willow) combined in the correct proportions with a blend of high quality flax seed and grains was formulated to provide maximum benefits for a wide variety of common ailments such as arthritis, stress relief, flu symptoms, muscle cramps, headaches and much more. One of the main reasons for our success is that when customers compare our products to the competition, they discover that ours is true aromatherapy, and not simply a fragrance based product - a blend that was physician formulated and really works. All the herbs in Isabella's Pacs are medical grade and organically grown. There are no chemical processes occurring, but simply a physical process of heating the herbs and the heating element. Most often customers find that when using our Comfort Pacs, the heat is more penetrating to the affected area than with chemical or electrical pads. There are a number of medicinal benefits in breathing our 12-blend aromatherapy. 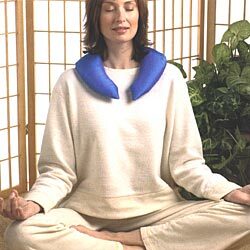 Customers generally respond very consciously to the sedative effect - a very pleasing, soothing and relaxing experience. The second is to aid breathing problems such as sinus congestion and sinus headaches, sore throats, coughs, congestion, headaches, and even asthma. The fabric covering our Pacs is 100% cotton. Our patterns consist of flannels, celestial prints, florals, animals, and an assortment of other fun prints for all personalities. We update our fabric selection often to keep up with the new fabric market. 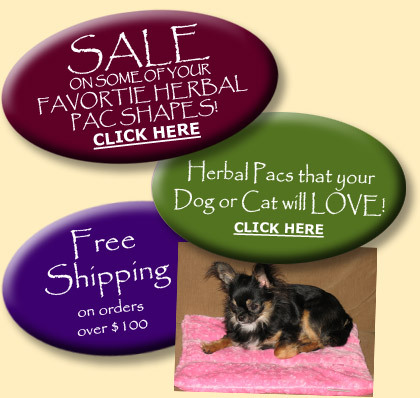 Our Herbal Pacs are used widely by Naturopaths, Chiropractors, Massage Therapists, Physical Therapists, Dentists as well as men and women of ALL ages.